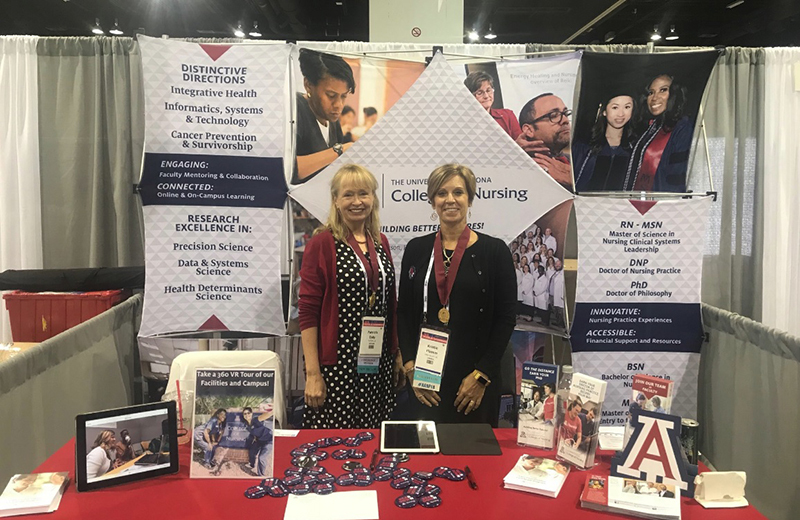 On June 28, University of Arizona College of Nursing wildcat nursing leaders Patricia Daly, PhD, FNP-BC, ENP-BC, and Kristie Flamm, DNP, FNP-BC, ACNP-BC, FAANP were among 63 nurse practitioners nationwide to be inducted as Fellows of the American Association of Nurse Practitioners (AANP) in Denver, Colorado. The AANP Fellowship program was established in 2000 to recognize nurse practitioner (NP) leaders who have made outstanding contributions to health care through clinical practice, teaching, research, education or policy. Nominees must demonstrate excellence promoting the NP role, ideally at a national or international level, and in two of four areas. AANP is the largest professional membership organization for nurse practitioners, representing the interests of more than 205,000 NPs nationwide as represented by approximately 58,000 individual members and 200 organizations. Through the organization, members provide legislative leadership at the local, state and national levels to advance health policy; promote excellence in practice, education and research; and establish standards that best serve NP patients and other health-care consumers.